Having trouble with stubborn breakouts? 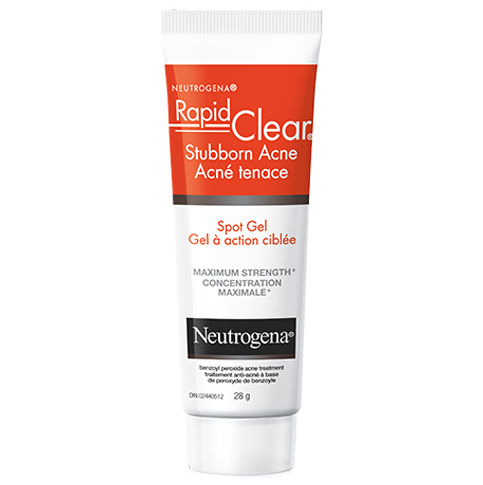 The NEUTROGENA® Rapid Clear® Stubborn Acne Solution is targeted at stubborn acne. This 3-step system fights three key signs of stubborn acne: size, redness and number of breakouts. The Rapid Clear® Stubborn Acne Cleanser and Rapid Clear® Stubborn Acne Daily Leave-On Mask are formulated with Benzoyl Peroxide, the acne medicine dermatologists recommend most for clearer skin, without a prescription. It kills and prevents acne bacteria to help treat and control stubborn acne. And unlike traditional masks, NEUTROGENA® Rapid Clear® Stubborn Acne Daily Leave-On Mask does not need to be washed off. Instead, you leave it on your skin, allowing acne medicine to work hard. It dries clear so you can use it under your moisturizer. No matter your skin type, it is always important to moisturizer skin. 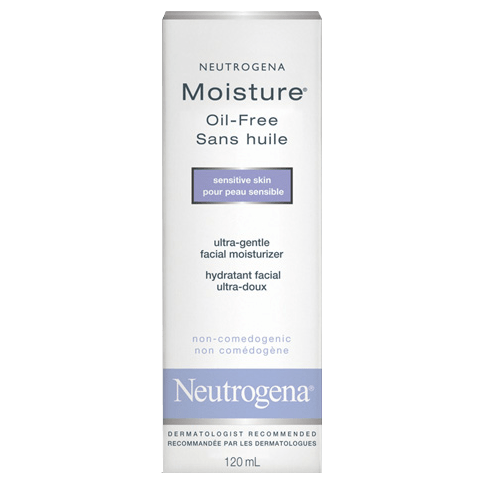 NEUTROGENA® Oil-Free Moisture is a lightweight, non-greasy, alcohol-free, water-based lotion that reduces dryness without leaving skin greasy and is specially formulated for sensitive skin. This formula is oil-free and won’t clog pores. With a cleanser, treatment, and moisturizer, this easy 3-step system will start showing results in just 4 hours* and help fight off stubborn acne. Step 1: Rapid Clear® Stubborn Acne Cleanser: Wet face. Gently massage cleanser all over face, avoiding eye area. Rinse face thoroughly with water and pat dry. New Users: Apply to small area once daily for 3 days to test for sensitivity. If no discomfort occurs, apply to entire affected area and rinse off. Start with 1 application, gradually increasing to 2-3 times daily, if needed. If dryness/peeling occurs, reduce to once a day or every other day. Step 2: Rapid Clear® Stubborn Acne Daily Leave-On Mask: After cleansing face with Rapid Clear® Stubborn Acne Cleanser, dry face thoroughly, and then apply Rapid Clear® Stubborn Acne Daily Leave-On Mask. New Users: Apply to small area once daily for 3 days to test for sensitivity. If no discomfort occurs, cover entire affected area with a thin layer. Start with 1 application, gradually increasing to 2-3 times daily, if needed. If dryness/peeling occurs, reduce to once a day or every other day. Step 3: Neutrogena Moisture® Oil-Free Sensitive Skin: Allow the leave-on mask to dry. Use 1 pump and apply all over face and neck. Use morning and night, alone or under make-up. Water (eau), Glycerin, Ethylhexyl Palmitate, Dimethicone, Petrolatum, Cetyl Alcohol, Cyclomethicone, Glycine Soja (Soybean) Sterols, Isopropyl Isostearate, C12-15 Alkyl Benzoate, Glyceryl Stearate, PEG-10 Soy Sterol, PEG-100 Stearate, Carbomer, Methylparaben, Diazolidinyl Urea, Sodium Hydroxide, Propylparaben, Ethylparaben, Tetrasodium EDTA. 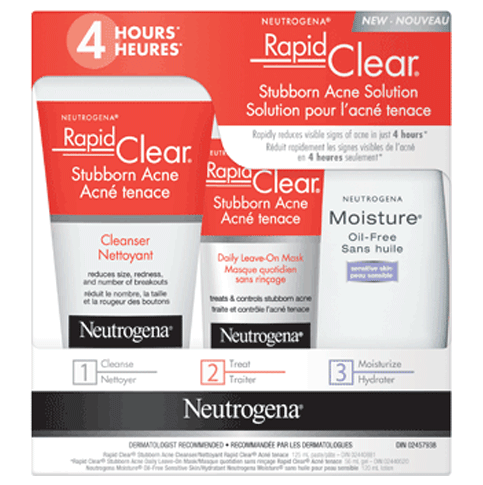 Offer valid on the NEUTROGENA® Rapid Clear® Stubborn Acne Kit only, purchased made between January 1, 2019 and September 30th, 2019. Max refund is CDN $29.99 before applicable taxes. If you are not completely satisfied with the product, for whatever reason, we will provide a refund. One refund per household/organization. Mail completed form (available HERE) with original receipt, packaging and minimum 40% of unused product within 4 weeks of purchase. Allow 4-6 weeks for refund. Offer valid in Canada only and subject to change. Click HERE for full Terms. I’ve struggled with acne for years. My mom bought me this kit, and i can’t tell you whether or not it cleared my skin, because i couldn’t use it. I tried the mask and it burned and was so so itchy. I got a rash on my face, mainly on my cheeks. I only used it once or twice, but I won’t use it again because of how uncomfortable and painful it was. That's no good! We'd expect our Stubborn Acne Solution kit to help clear your acne concern, not cause a reaction. When you can, please give us a call at 1-888-663-8876 so we can learn more and see how we can help. We're here to chat M-F, 9AM to 5:30PM ET. We're looking forward to talking soon! Up until two weeks ago, I had an outbreak of acne on my forehead for over a year. I hoped by not putting any makeup/foundation on, it would go away but it never did. 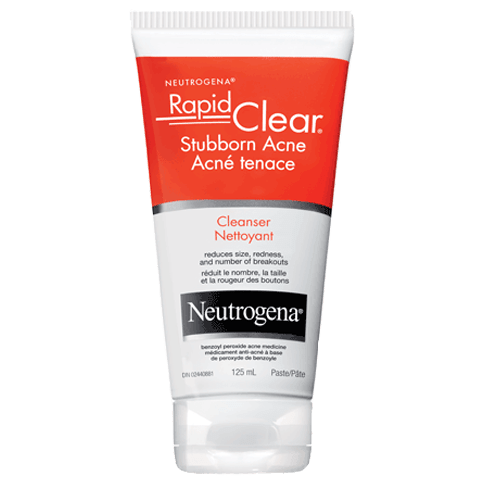 Finally, I tried the Neutrogena Rapid Clear Acne Cleanser and immediately saw results. After just one week of use (once a day before bed as I am fair-skinned) my forehead became completely clear. I am so happy I tried this product! Highly recommend! We're sorry to hear this! We'd like to follow up with you to learn more. Please call us at 1-888-663-8876, M-F 9am to 5:30pm ET. We hope to speak with you soon! I've only used this product for 5 days. In this short time the results have been incredible for me! I can't even count how many different acne washes I've tried with no luck. The wash does have a cooling effect and may irritate your skin if you're on the more sensitive side. Overall I'm very happy with this product, I wish I could attach a picture to show the results! Hey there! Thanks for sharing your feedback with us! We'd like to learn more about your experience with our Stubborn Acne Solution. When you have a moment, please give us a call at 1-888-663-8876, Monday-Friday from 9a-5:30p ET. We're looking forward to your call! I was gifted this product, tried it on my face. It gave this burning, itchy feeling. Now my skin is peeling, I have rashes on my forehead. Hey there, thanks for sharing your feedback with us! We're so sorry to hear you had this reaction after using our Rapid Clear Acne Solution. We'd like to learn more about your experience and help to make this right. Please give us a call at 1-888-663-8876, Monday-Friday from 9a-5:30p ET. Hope to hear from you soon! I bought this product over a week ago, tried it once and a day later my face was inflammed sore, puffy, red and rash like. It hurt to touch and had to see a doctor to help with the reaction. Make sure to test the product on ur skin located in a small spot, it will save you from a week of discomfort. We're so sorry to hear about this! We'd like to speak with you to learn more and see how we can help. Please give us a call at 1-888-663-8876. We're available Monday through Friday, 9am to 5:30pm ET. We look forward to speaking with you! Has taken down the redness and number of breakouts. I really enjoyed this product i have been using it for a couple of weeks now and it is showing huge differences! Make sure to use the moisturizer because without it the other products will dry your skin up. Make sure to drink lots of water while using this product because acne does need the help of some water cleansing your body in order for it to disappear! Thanks for taking the time to write a review! So glad to hear you are seeing a huge difference in your skin. We'd love to learn more about your experience with our kit and how it is working for your skin. Call us at 1-888-663-8876 so we can chat. We're here Monday through Friday from 9am-5:30pm EST. We look forward to speaking with you!